You've been doing all the 'right' things. Juggling being the content creator, marketing manager, financial forecaster and CEO of your business. The business you started because you craved more of a work-life balance. But keeping all the balls in the air is starting to wear you thin. You've been following all the advice. That marketing-guru you've been stalking online, your accountant's sage business plans and the wise wisdom of those that have trodden the path before you. 'Is this even worth it? Maybe it's easier if I get a real job? You've bought the courses that promised it all. The e-books, e-courses and other online programs that all said they would show you the ropes, give you a step-by-step guide. But they haven't quite felt right. They haven't left you feeling energised and aligned to your big visions. Darling one, I want you to know that you're not alone. Many women have walked this same path before you. Navigating how to bring their spirited self into the realm of running their online business. What if I were to tell you there was a different way. A way that aligns with the way you want to feel? Soulful business academy is a 12 week program for soulful business owners who are ready to step up, be seen and make a real impact with the work that lights them up. This course was created for you. If you've been searching for a different way to do business, then darling, step right this way. A get rich-quick scheme, or a program that merely scratches the surface of the things you need to know. A whole-hearted business school for women forging their own path, showing them how they can feel connected, supported and guided through the process of kick-starting or up-levelling their business. Because running your own business should feel good. It's time we collectively turned the page in our journals and start writing a new business success story. One that values lifestyle and relationships over money and marketing. One that sees you in-flow and attracting what you want into your life and business. It's time you equipped yourself with the tools, know-how and mindset that will start you on the business trajectory you've been dreaming of. Who is Soulful Business Academy for? Soulful Business Academy is for coaches, spirit junkies, soul-o-preneurs and creatives who are looking for a new way to run their business. You wouldn't want a pilot to fly your plane, without a clear path to your destination - so why would you want to run your business without some purposeful planning? Successful business are sustainable business - so it's important you're working in a way that feels good and meets your dream clients where they need you most. You want to be the go-to gal for your dream clients, be known for changing their lives, so you know you want to make the best first-impression. You know that you want to create a connected community, but the thought of 'marketing' your business is bringing up all kinds of 'sleazy-salesman' feels. Instead, you want to create a loved-up and eager tribe around your business. Why building a newsletter tribe is key to building your business. How to navigate the technology side of building a newsletter tribe. Putting yourself out there (even if it is 'just on the internet') can feel dawnting and scary - I get it! But creating meaningful content allows you to reach into the lives of your dream clients - right through the computer screen. Breaking through the mindset barriers holding you back from showing up and shining! You've created a blog or website, crafted your perfect offerings but maybe you're still hearing crickets. Social Media can get a bad-wrap and sometimes it takes more energy than you can handle - but I promise you there's a soulful way you can show up for your tribe and expand your reach. Ways to show up, focusing on fostering engagement and connection. 'Understanding Your Social Media Insights' - a comprehensive guide to understanding your analytics and improving the social media experience for both you and your dreamies. When you've created beautiful offers that meet your dream clients where they're at and you're showing up, it's time to nurture the relationship. How can you go deeper and keep your dream clients coming back for more. Working in a way that feels good means that you'll likely identify some items that you don't want to give your energy to, but are crucial to your business' success. Developing systems and even hiring a VA can be essential to taking your business to the next level. Determining what to outsource, what to keep and what actually doesn't need doing! Hiring your first team member - should you bring someone into your business, or outsource? Technology Toolkit - my go-to guide for the technology that your business needs (so you don't have to go through all the headaches figuring out which ones to choose). Mastering PR, Public Speaking & Hosting Events can help you expand your reach and engage with new dream clients in a natural way. Finding collaborations that are beneficial to both sides of the collaboration. Working in a collaboration is a great way to build your brand. This online program is designed to support and encourage you. No doubt you'll have questions along the way, and I want you to know I'm there to support you along the journey. Throughout our 12 weeks together, we'll jump on Zoom together where you can get personalised feedback, ask questions and support each other in the program. My intention for Soulful Business Academy is to create a welcoming and supportive space where you can come as you are, and explore the tools that will help take your business to the next level. What better way to expand your business than to connect with others also participating in Soulful Business Academy. I'll personally be interacting in the Facebook Group, with additional Q&A time, extra tips and tools to help you create your soul-filled business. I've been through the hard-yards, trying out new technologies (and tearing my hair out over them), hours of streamlining my systems and processes, developing marketing strategies and tools - and I want to share them with you. Because you don't need to go through all those headaches. I'll be sharing with you done-for-you scripts to help you communicate better with your dream clients, pitch that podcast or develop your sales-funnels. Plus, there's loads of templates and tools I've created just for you. All inside Soulful Business Academy. I've rounded up some of my favourite business babes who are making waves in their own unique way. They're experts in specific areas and will share their tips and tricks with you! They'll guide you on mindset, strategy and marketing your business. My vision is for Soulful Business Academy to be your go-to-guide for creating a business that lights you up and nourishes your soul. By offering you lifetime access, I know Soulful Business Academy will be the resource that will support you. Through lifetime access you'll be able to come back to any of the resources time and time again, no matter what stage of business you're at. PLUS you'll receive access to all future updates, additional resources and bonus materials - with the option of joining in any future rounds LIVE for added accountability and support. Because I’m so excited for you to start creating your soul-filled business, one that feels good and lights you up, I'm giving you the opportunity to join Soulful Business Academy in it's first round, for the introductory price of $797AUD. Are you ready for all this goodness? You're covered with our Frequently Asked Questions!!! When does Soulful Business Academy begin? We officially kick off on Monday 4 September. Whilst you'll receive access to Module 0 and our exclusive Facebook Community on August 25, this is a preliminary pre-program module to set you up for success. Module 1 will land in your inbox on September 4. Soulful Business Academy is a mixture of insightful video content, where I'll be sharing the concepts with you, easy-to-complete worksheets and a bunch of handy bonus resources (think: guided meditations, done-for-you scripts, templates and trackrs. Will I get 1:1 support? For the price-point of Soulful Business Academy, 1:1 support isn't included. However, as this is the introductory round, numbers will be limited - so you'll be getting loads of attention in our private Facebook Community and Live Group calls. How much time will I need to complete the content? The 8 core modules are delivered over 12 weeks (we've got 3 dedicated implementation weeks included - so you've got extra time to implement your learnings). However, as you'll receive lifetime access, you can work your way through the content at your own pace or come back to any of the resources at any point in the future. With this being the first round of Soulful Business Academy it's offered at a great introductory rate. Therefore, a refund or change-of-mind period is not included. There's so much great content included that I'm positive it's worth every single dollar (and more!). I'm a Marketing & Business Coach for female entrepreneurs just like you. I help women create soulful strategies that have allow them to show up in the world in a way that feels aligned and connected to their big visions. Through mixing the practical marketing knowledge (and proven strategies) with soul-centered techniques that put all of your goals on the table. "Elle was a dream to work with. She took the time to understand my business and the vision." 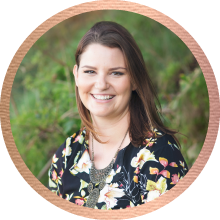 “Working with Elle, I experienced the magic of working with someone that has an amazing visual eye AND marketing and copywriting experience all in one." "Working with Elle is seriously amazing! I felt so looked after and like Elle was really invested in my idea." Are you ready to create a business, the soulful way? Soulful Business Academy is a product of JuJu Creative Hub.